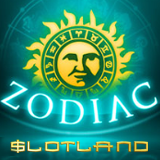 Gamblogger: New Zodiac Slot at Slotland -- Introductory Freebies this Weekend! New Zodiac Slot at Slotland -- Introductory Freebies this Weekend! The stars say the time is right, so Slotland has just unveiled Zodiac, an astrology-themed slot game with four cosmic bonus features. Until July 3rd you can get freebies and a choice of deposit bonuses to try it. The 12 signs of the Zodiac spin on the five reels of this 40 (fixed) payline slot game. The Aquarius and Pisces high value symbols pay out 1000X the bet. Three Sun scatters pays an instant cash prize of 100X the bet and triggers one of four bonus features. The Wheel of Elements above the reels says which of the four different bonus games it will be: Earth, Air, Fire or Water. Each one triggers either free spins with up to 20X win multipliers or a pick me feature awarding up to 10X multipliers. Until Monday, Slotland has a $15 freebie for players who want to take Zodiac for a spin. (VIP players get a $25 freebie.) There is also a choice of deposit bonuses with various wagering requirements available until July 3, 2017. 20X wagering requirement, 7X max. cash-out (VIPs 16X). Valid for Zodiac only. 20X wagering requirement; valid for Zodiac only. These bonuses can be claimed twice a day and are valid for all slots, Keno and progressive jackpot games. Zodiac first appeared last summer at Slotland’s partner casino, WinADay where it’s been one of that casino’s most popular games ever since. It's now available only at Slotland and WinADay Casino. Both casinos welcome players from all over the world and set the standard for friendly, efficient customer service.